Thirsting for true light: Excuse me. Brothers and sisters, recently a question has been disturbing me. Although I prayed to the Lord and searched in the Bible many times, the problem still haven’t been solved. So I want to seek your help here. I hope everyone speak actively. May the Lord lead us! We believe in the Lord for the same wish that we can be taken into the kingdom of heaven. Particularly we see these words in the Bible: “I go to prepare a place for you. And if I go and prepare a place for you, I will come again, and receive you to myself; that where I am, there you may be also” (John 14:2-3). That the Lord Jesus resurrected and ascended to heaven was to prepare a place for us, so the place the Lord prepares for us should be in heaven. We just need to watchfully wait and when the Lord returns, we will be lifted into the air to meet the Lord and enter into God’s kingdom. But I heard a different opinion lately: The kingdom of heaven is on earth, not in heaven. When I heard this answer I was a little surprised, but I dared not to define it blindly for no one could fathom God’s wisdom. So I feel confused: Is the kingdom of heaven exactly in heaven or on earth? Jinghouchensi: Be quiet, please! Look at the message above. Our sister Thirsting for true light met a problem and is seeking our help now. Let’s see if we can help her solve it. Everyone is thinking, and quiet reigns all over. Weijin: Now since no one answers it, let me be the first. I think that the kingdom of heaven must be in heaven. Let’s think about “the kingdom of heaven.” Since we call it “heaven”, it means the kingdom is in heaven. How could it be on earth? In addition, the Lord Jesus said, “I am the way, the truth, and the life: no man comes to the Father, but by me” (John 14:6). 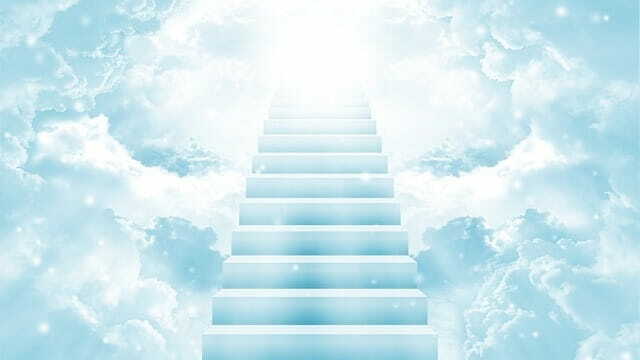 We all know that the Lord Jesus resurrected and ascended to heaven with the clouds, and told His disciples who followed Him that He was going to prepare a place for us. Since the Lord Jesus went to heaven, certainly He would prepare the place for us in heaven. If the place is on earth, we certainly can see it. So the kingdom of heaven is in heaven, instead of on earth. Am I right? Jiadao (in agreement): Yes. The kingdom of heaven is in heaven. It is a fact, isn’t it? What do we still doubt? Jinghouchensi: I can’t agree with your words. God said: “I will behave myself wisely in a perfect way.” No one could fathom God’s wisdom, and God’s work goes beyond the thoughts and conceptions of us humans. It is like when the Lord Jesus came to do His work, the high priests, scribes and Pharisees all lived in accordance with their own conceptions and imaginations that if Messiah came, He should be born in a rich family and have a high status. But no one thought that the Lord Jesus was born in a manger, and moreover He was a son of a carpenter. Finally, they crucified the Lord Jesus, and then were cursed and punished by God. As a result, the nation of Israel was destroyed, and the Israelites lived a wandering life. From this example, we can see that we can’t define God’s work according to our own conceptions or imaginations. Weijin: It’s sure that God’s work is incompatible with our conceptions. But the way in which we receive it is based on the Bible, how could it be wrong? Mu Xunqiu: Uh … I’m not sure. Although we all wish to enter God’s kingdom and feast our eyes on the beautiful view of the kingdom of heaven, I dare not to define it blindly before the fact is revealed. Thirsting for true light: Everyone has your own reasons. It seems that there are some mysteries to be sought in this question. If we don’t solve the mystery, I’m afraid that we’ll live in our own conceptions and imaginations, and that if God comes to work in the way that is not consistent with our imagination, we’ll misunderstand and blame God at any time. Furthermore, maybe we’ll define God with conceptions and imagination like those high priests, scribes and Pharisees, and at last follow in their footsteps to destruction and miss God’s salvation. So we hope someone that understand it could guide us on this question. Yang Guang: Brothers and sisters, I’m sorry I’m late. I hope I don’t miss the conversation today. A preacher once communicated with me about the problem you are talking about. Mu Xunqiu: Please communicate with us! Weijin: I also want to listen to your opinions. Fellowship with us, please! Yang Guang: Thank the Lord! To know the kingdom of heaven is exactly in heaven or on earth, first we must understand what the kingdom of heaven is. We all know that the “heaven” means Heaven—God, and the kingdom of heaven must be God’s kingdom—the kingdom that God holds dominion, also Christ’s kingdom. So, is God’s kingdom exactly in heaven or on earth? For this question, let’s see what the Lord’s Prayer says: “After this manner therefore pray you: Our Father which are in heaven, Hallowed be your name. Your kingdom come, Your will be done in earth, as it is in heaven” (Matthew 6:9-10). The words of the Lord Jesus is clear, right? The Lord required us to pray, “May God’s kingdom descend upon the earth and God’s will can be carried out on the earth.” The Lord Jesus didn’t say God’s kingdom would be built in the heaven, and He never let us pray for being taken up to heaven! Let’s think about it. Is this not the case? If we always wish to be taken up into heaven, it is not in accordance with God’s words and His will, is it? Thirsting for true light: Right! It seems right! Yang Guang: Let’s read the prophecies of the Book of Revelation: “And the seventh angel sounded; and there were great voices in heaven, saying, The kingdoms of this world are become the kingdoms of our Lord, and of his Christ; and he shall reign for ever and ever” (Revelation 11:15). “And I John saw the holy city, new Jerusalem, coming down from God out of heaven … Behold, the tabernacle of God is with men, and he will dwell with them, and they shall be his people, and God himself shall be with them, and be their God” (Revelation 21:2-3). Read carefully, these two prophecies respectively mention that “The kingdoms of this world are become the kingdoms of our Lord, and of his Christ,” “the holy city, new Jerusalem, coming down from God out of heaven,” and “the tabernacle of God is with men.” All of these words refer to the kingdom of Christ being realized on earth. After hearing all this, everyone could speak out your opinion. Is Christ’s kingdom predicted in the Book of Revelation exactly on earth or in heaven? Thirsting for true light: It is on earth. Yang Guang: Yes! Christ’s kingdom is on earth. Chang Xiangsi: Thanks be to the Lord! God’s kingdom is really on earth! The prophecies of the Book of Revelation says so clearly, but we never see it! How blind we are! Mu Xunqiu: The prophecies of the Bible are truly mysteries. If they are not fulfilled or no one fellowships with us, how could we understand them? Jinghouchensi: The Lord’s Prayer has clearly says: “Your kingdom come, Your will be done in earth, as it is in heaven.” God’s words has spoken so clearly. God’s kingdom is on earth and His will shall be carried out on earth. We recite the Lord’s Prayer every day, but why do we not understand? Jinghouchensi: I think there is indeed the enlightenment and guidance of the Holy Spirit in the fellowship today. Only by now have I understood that the kingdom of heaven is exactly on earth, not in heaven. Alas, we lived in accordance with our own conceptions and imaginations in the past, and even still imagined that the Lord would come to take us up to heaven. Take me as an example. I often watched the skies to wait for the Lord to welcome me to the heavenly home. I have never dreamed that God’s kingdom is on earth. Mu Xunqiu: Yes. The pastors and elders can’t talk about the reality of the truth of the Bible, but merely a lot of conceptions and imagination to entrap us. For the sake of being taken up to the kingdom of heaven, how many absurd things we have done? These years we often went to pray at the top of mountains, just because we thought the mountain top was closer to the sky. If the Lord came, we could see first and be taken up. Alas, how foolish we were that time! Chang Xiangsi: Ah, that’s right! I often looked up to the sky formerly when I went out, and I would find which cloud was more white or special. Well, if I found one, I would think: Will the Lord come back on this cloud to take us back to the heavenly home? Ah, in this way, I have waited and prayed for so many years but I still don’t see the day that the Lord takes us up to the air to meet Him. We knew none of the truth when we listened to the pastors and elders’ sermon in religion, and merely did the absurd things. Thirsting for true light: Ah, you are not the only one. What I did is much more ridiculous. You don’t know, in order to be taken to the air to meet the Lord, I often fasted and prayed, and controlled my appetite at ordinary times. I thought that if I ate less, I would be lighter. If the Lord came, I would be easy to be taken up to heaven. After listening to the fellowship of brothers and sisters today, I feel so enlightened in my spirit! I will never do foolish things again. Doing like this, not only do I have no guidance of the Holy Spirit, but I will easily be abandoned by the Lord. Sister Yang, could you fellowship more with us about how to welcome the Lord and enter the kingdom of heaven? Yang Guang: Thank the Lord! The Bible has explicitly told us the way to get into the kingdom of heaven. It is just because we don’t discover it. Now let’s read some scriptures: “He that has an ear, let him hear what the Spirit says to the churches” (Revelation 2:7). “For the time is come that judgment must begin at the house of God” (1Peter 4:17). From the two verses, we could see that in the last days the Lord will do the work of judgment starting from the House of God to speak to us personally. The Lord Jesus said: “My sheep hear my voice….” (John 10:27). The wise virgins will welcome the Lord when they hear the Lord has come and feast with the Lord. They accept the shepherding and watering of God’s words, experience the judgment and chastisement of God and are purified and perfected. This kind of people will be qualified to enter God’s kingdom in the end. Thirsting for true light: What you said is so enlightening. I understand it. To welcome the Lord and feast with Him, we should be a wise virgin who can recognize the voice of the God. What are we waiting for? Let’s find the church which has witnessed that “the bridegroom has arrived” and then seek and investigate right away! Mu Xunqiu: Thanks be to the Lord! Most people also read: What’s the Way for the Coming of Jesus? People entering the kingdom of heaven will live with God. How can an impure man enter into the kingdom of God? Think back to the Jewish Pharisees of that time. Why could all that they did not be approved by the Lord Jesus? Only those who follow the heavenly Father’s will can enter the kingdom of heaven. How can we follow His will? Does laboring for the Lord mean following His will? Every Christian is longing to enter the kingdom of God. But what are the criteria for entering the kingdom of God? Through this sermon you’ll get the answer!